Before we get into today's Crocktober recipe, let's have a little heart to heart. Now I'm just a small town girl from West Virginia. The flavors of the Caribbean are not something I work with on regular basis, but one of the great things about social media is the fact that you meet new people, who introduce you to new flavors. Take my friend Kim for example. Kim (from the Youtube channel Free to Family) is married to an islander, and he made this AMAZING Stewed Brown Chicken Recipe. I tried the recipe for myself and fell in love with the flavors so that encouraged me to explore a little more with these spices! 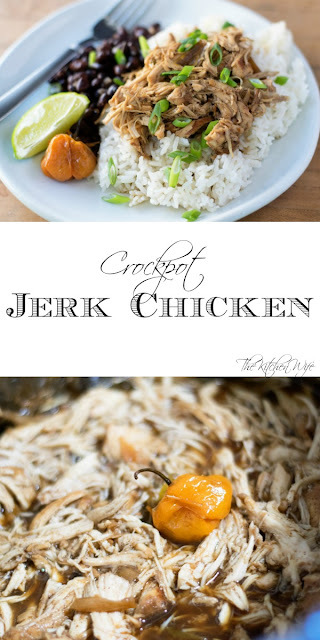 That's where this Crockpot Jerk Chicken Recipe evolved from! To begin you will place the chicken in the bottom of your slow cooker. Now combine the lime juice, soy sauce, garlic, all-spice, ginger, cinnamon, and thyme in a small mixing bowl. Now roughly chop the green onions. Throw those into the crock pot with the chicken and spices. It's time to prep the habanero. There are a few ways you can do this. If you like your jerk chicken SPICY than just chop that sucker up, seeds and all, and toss it in. If you like it more of a MEDIUM heat person remove the seeds, dice it up and toss it in. HOWEVER, if you are like my family we enjoy more of a MILD spice, so I simply take a pairing knife, poke holes in the chili and toss it in. Now you can place the lid on your crockpot, turn it on LOW, and set the timer to 6 HOURS. This is what things will look like after 6 hours. I will warn you the smell is intoxicating! Remove the chicken from the crockpot and shred with a couple forks. Return the chicken to the slow cooker and you are ready to eat! 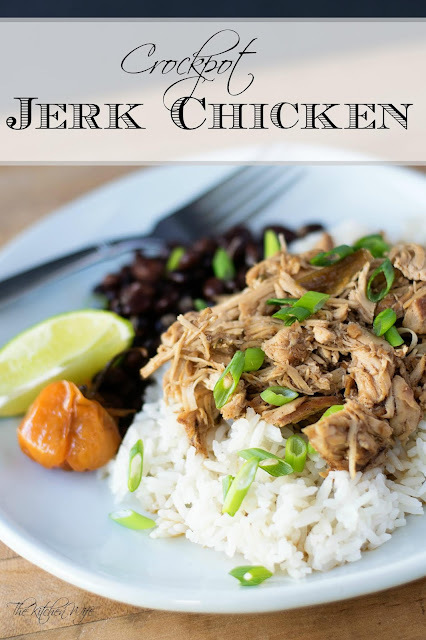 I like to serve this Crockpot Jerk Chicken Recipe over a bed of fluffy, white rice with a side of black beans and a lime wedge. The flavor is so yummy. It's a little sweet, a little salty, a little spicy. It hits all the high notes on your tongue and you are going to love it, so get in the kitchen and make it TONIGHT! Place the chicken into the bottom of the crockpot. In a mixing bowl combine the lime juice, soy sauce, garlic, brown sugar, all-spice, ginger, cinnamon, and thyme, whisk together and pour over the chicken. Roughly chop the green onions and sprinkle over the chicken in the crockpot. 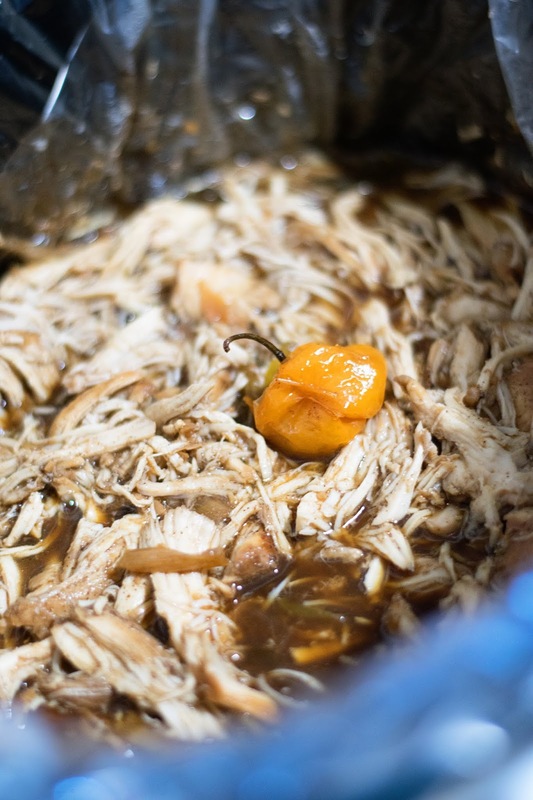 Prepare the habanero chili to your liking* and place in the crockpot. Remove the chicken from the crockpot and shred. 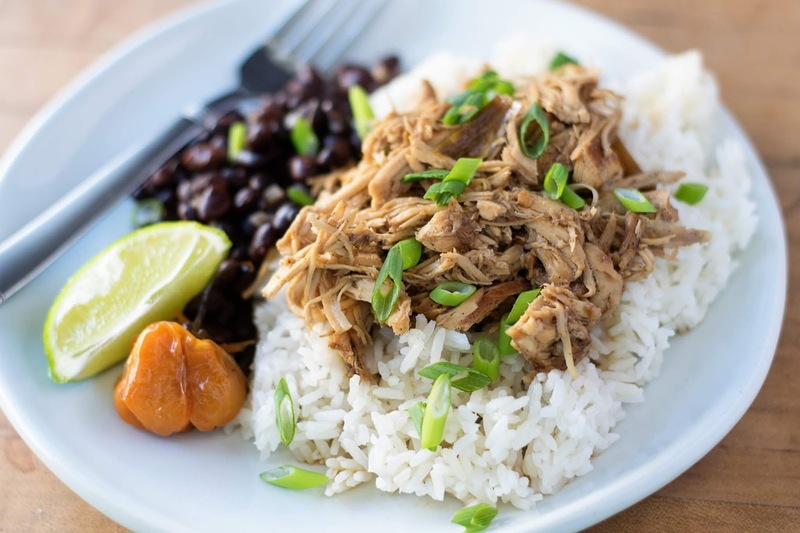 Return the shredded chicken to the crockpot. * For MILD HEAT: poke holes in the pepper with a knife and place in crockpot. For MEDIUM HEAT: Remove the seeds, dice and place in crockpot. For HOT HEAT: Dice the pepper seeds and all and place in the crockpot.